I have to say I have been really happy with my Raspberry Pi devices so far. I have a couple of 1st gen Rpis, one is running OpenElec for streaming movies from my home server movie library and another one is running arch linux and working as a DHCP/DNS server and network monitor with ICINGA. Now I received my first Raspberry Pi 3 from Element14 (€38.20). It has more CPU power (with 1.2GHz 64-bit quad-core ARMv8 CPU), more memory (1 GB), integrated 802.11n Wifi (2.4 GHz band), bluetooth LE and lots of other improvements compared to the original RPis. My intention now is to try to install the ownCloud server software to the new RPi 3. 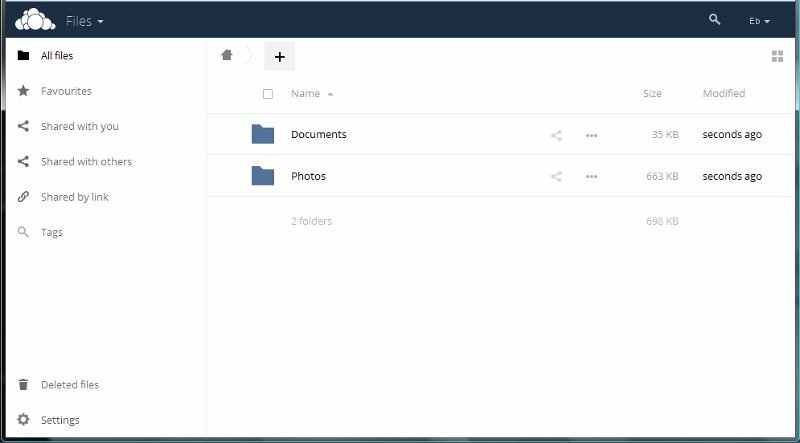 With ownCloud (see https://owncloud.org/) you can create your own dropbox like service that you can use for sharing documents, photos and other files and information (calendar, contacts, etc.). I have a 8GB microSD card that should be ok to get started. So let’s download the Rasbian zip file (2017-01-11-raspbian-jessie.zip), unzip the file and write the image to the SD card. I will use my windows based image writer (Win32DiskImager) for that task. Alright, let’s connect the 2 amp power supply and see what happens. Booting… and ready! During the boot the SD card root partition was resized automatically to occupy the whole card space. Looks like I have about 3 GB still available on the root partition. First I will need to connect to my home wi-fi network to get some connectivity. That is easy, just select the correct network from the network applet (on the right hand side of the task bar) and enter the password. And we are up and running! 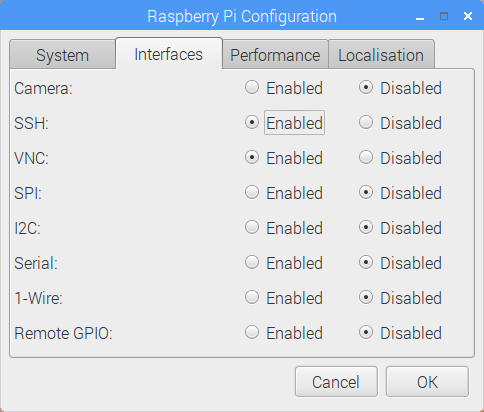 For other basic setups just go to the main menu and select: Preferences > Raspberry Pi Configuration. In the System tab the most important thing is the pi user password. The default password is ‘raspberry’ which everyone knows and which should be replaced with a good password that only you will know. I will also disable the Auto Login feature, because I am going to create a new account for myself. 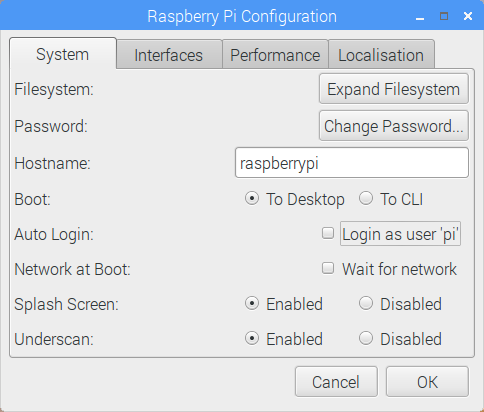 Here you can also change the hostname if you are not happy with ‘raspberrypi’. In the Interfaces tab I will enable two services: SSH and VNC. The ssh service is essential for remote RPi administration. The VNC service allows access to the whole X-windows GUI remotely with a VNC viewer. Nothing to change in the Performance tab. In the Localisation tab I can set the country specific features (like the correct keyboard layout). A reboot is required to make the changes effective. Let’s do that now. After reboot the ssh and vnc servers should be running. A simple test for ssh is to try to connect to the localhost. 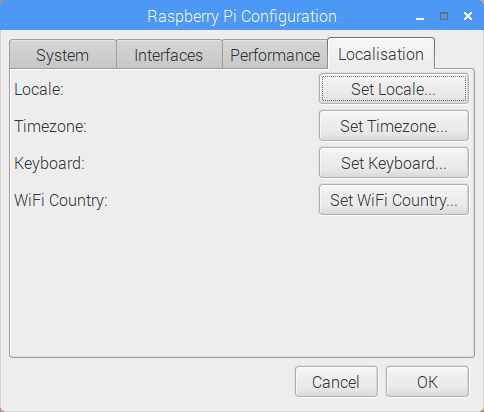 It is also possible to configure the settings from the command line with the raspi-config tool. Just open a terminal and run the tool. As I’m going to use the RPi as a server it is better to switch from dynamic (DHCP) IP address to a static one. 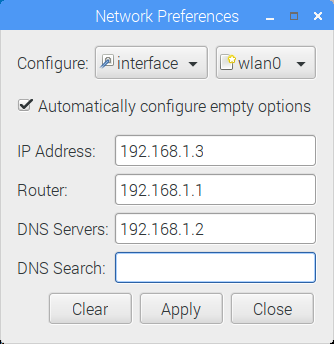 Right-click the network applet in the task bar and select: Wireless & Wired Network Settings. And then fill in the desired IP Address, the router address and the DNS server address (in most cases this is the same as the router address). The changes are taken into use after the next reboot. Next I will add an account for myself so I don’t need to use the default ‘pi’ account. Just replace ‘eb’ with whatever username you want below. Also let’s make sure that we have the sudo rights to run commands with elevated priviledges (just like the pi user currently). The video group is needed if you want to run mathematica on RPi. To test the new account just logout the pi account and login with the new account. You have the iptables firewall available by default, but there are easier ways to setup the firewall. I will use the ufw tool. Looks good. To further tighten the ssh access we could specify what accounts are allowed to login with ssh. We need to edit the ssh server configuration file /etc/ssh/sshd_config and change the following parameters to 1) not allow root user to login 2) only allow user ‘eb’ to login (thus user ‘pi’ is not allowed). Now we just need to restart the ssh service so that the new configuration is taken into use. To also allow a VNC connection through the firewall we could be more specific with the rules. If we only want to allow access to the GUI from the local LAN we could specify the IP addresses in the rule. The TCP port number is 5900. As a final step to setup the system let’s get all the latest bug fixes and other updates to the operating system. The pprompt package provides an additional check to make sure the default password for the pi user is not used. 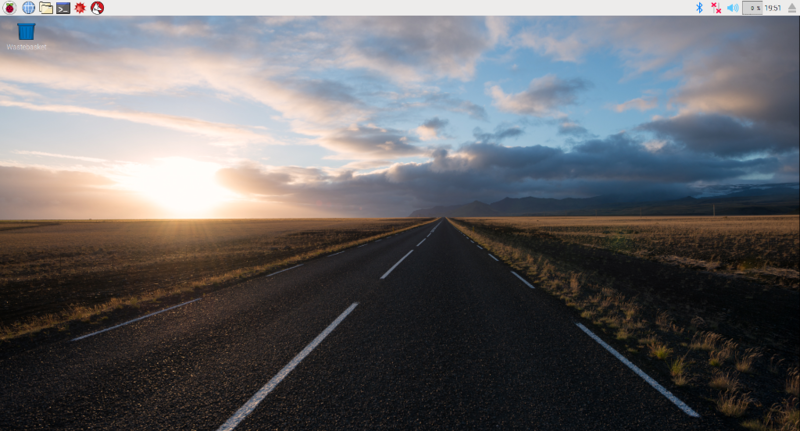 To get started we need to install a webserver (nginx), php5, database (sqlite3), SSL support (openssl) and a couple of other tools (like varnish for HTTP acceleration, git for version control). The nginx webserver should now be running and listening on port 80. The port is not open yet in the firewall but you can check the server by going to address http://localhost/. To make the certificate acquisition possible we need to do two things: 1) change the default web server root and 2) allow port 80 (http) and 443 (https) through the firewall. Most of us also have a router with its own firewall. The router settings should be changed so that the ports 80 and 443 on the router will be forwarded to the corresponding ports on our RPi. First edit the default web server root defined in /etc/nginx/sites-available/default. Change /var/www/html to /var/www/owncloud. Then restart the web server. Using the webroot path /var/www/owncloud for all unmatched domains. Make sure the private key permissions are set so that only root can read the file. Next we need to update the web server default configuration to fully operate with ownCloud. Just delete the current contents (make a backup if needed) and replace with the following example (replacing rpi.cloud.com with the correct domain name). This configuration was copied from the owncloud.org site. # Before enabling Strict-Transport-Security headers please read into this topic first. Here are some other settings that should be changed. In the file /etc/php5/fpm/php.ini set the maximum upload file size (e.g. 2GB). The setting always_populate_raw_post_data should also be set, otherwise ownCloud will complain about that later. In the file /etc/php5/fpm/pool.d/www.conf update the socket definition to match the web server default setting. Also uncomment the lines that define environment variables. In the file /etc/dphys-swapfile update the swap file size. Next we need to restart the web server (and check that it does not complain about the new configuration). So first I will just power off the RPi and connect the USB drive. After reboot everything seems to be still going well. The new drive seems to be connected to /dev/sda1. Let’s create a new ext4 filesystem to the disk and mount the disk in /media/owncloud. We also want to mount the drive automatically at boot time. That can be accomplished by editing the file system table in /etc/fstab as shown below. To test that the fstab settings work just umount the drive and mount it again using just the mount point name. As a final step let’s create a subfolder ‘data’ to the owncloud disk and set the owner to www-data. The current ownCloud stable release seems to be 9.1.4 so I will install that one. Let’s get the installation package from the ownCloud site. Next we need to replace /var/www/owncloud with the downloaded content. So let’s first delete the current folder and then move the new folder to the same location. Make sure www-data owns the files. ownCloud is now installed. Just reboot and you should be able to open your ownCloud configuration page. Click the label: Storage and database and change the data folder location to /media/owncloud/data. Enter the username and password for the admin account and click Finish setup. 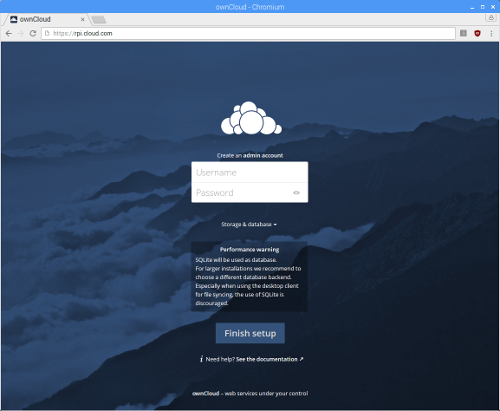 Looks like we have a our ownCloud server up and running! Before starting I will create an ordinary user account for me. I will then use that account for syncing content. Let’s download the windows installer. The setup is really simple, just enter the server address, the username and the password and the local folder where files will be synced. The local folder is now automatically synced from the RPi ownCloud server. E.g. 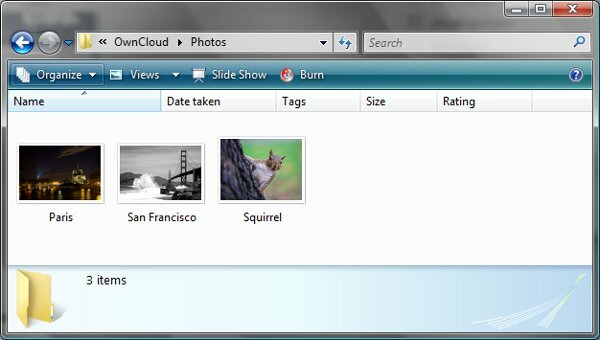 I can now see the example photos in my local windows folder. To further tighten the SSL security level of our ownCloud server we could do a couple of additional changes. These are based on the excellent SSL security tutorial: https://raymii.org/s/tutorials/Strong_SSL_Security_On_nginx.html. First we need to generate a stronger Diffie-Hellman key exchange parameter (this takes a very long time, I let it run over night). Then we can update the nginx SSL parameters in the file /etc/nginx/nginx.conf. I did get the ‘A’ rating so I think the server should be pretty secure now at least what comes to the SSL protocol. Your cert will expire on 2017-05-06. 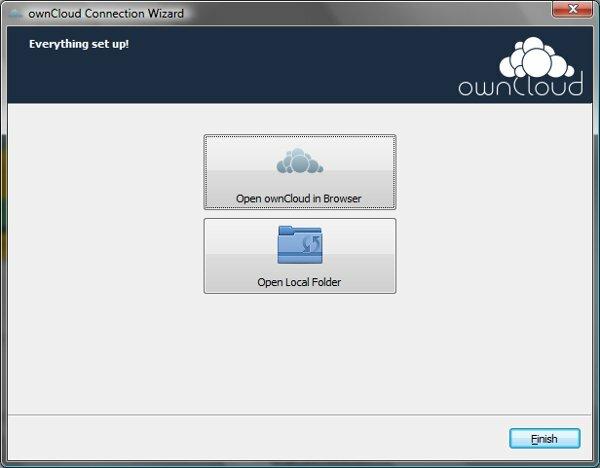 After the certificate has expired the ownCloud access will fail. E.g. Firefox refuses to connect and tell’s that the certificate is no longer valid.